Kevin Thompson of Thompson Burton PLLC. UPDATED 11:28 P.M. EDT (U.S.A.) Scammers have used the names of government agencies and famous businesses in bids to dupe the public. Now, the name of a well-known MLM law firm appears to have been used for the same purpose. Attorney Kevin Thompson published a Blog post today that warns of a bogus Banners Broker/Profit Clicking “Claim Form” on the Web. 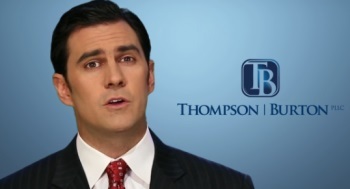 Thompson is with Thompson Burton PLLC in Tennessee. Such events have been associated with phishing schemes and identity-theft schemes. Banners Broker is a bizarre “program” that, like many HYIPs, purports to be in the “advertising” business. Promoters have claimed that sending money to Banners Broker results in a doubling of the cash. ProfitClicking is a scam that rose up to replace the JSSTripler/JustBeenPaid scam purportedly operated by Frederick Mann. Mann, a former pitchman for the AdSurfDaily Ponzi scheme, may have links to the “sovereign citizens movement.” “Sovereign citizens” may express an irrational belief that laws do not apply to them. Regulators in Italy and the Philippines have issued warnings about JSS/JBP or ProfitClicking, both of which featured Terms similar to those of Legisi, a $72 million HYIP fraud scheme broken up by the SEC and the U.S. Secret Service in May 2008, about three months before the AdSurfDaily Ponzi scheme ($119 million) was exposed. In August 2012, the SEC described Zeek Rewards as a $600 million Ponzi- and pyramid scheme. A number of reload scams have surfaced in its wake. At least one appears to have been a bid to dupe people into sending money to an entity that was posing as a U.S. government agency while claiming to be a recovery vessel for Zeek members who lost money. Thompson is encouraging people who may have information about the purported Banners Broker/Profit Clicking “Claim Form” to contact him here.